It’s cool to be different these days, and if you’re in the dining sector, you’ll be attuned to the preferences of the funky hipster types; no more is it sufficient to offer five different beers or a range of wines from all over the country. To be in vogue, you’ll need to offer more craft beers than a backyard brewery and have wines from countries and regions that only a globetrotting traveller would have heard of. If you operate a restaurant or funky café and don’t have wines from the old world as well as a few up and coming new world regions, the cool kids will turn up their noses on social media and insta a pic of them walking out the door to find a groovy new bistro! It’s caught me a little by surprise, but one of the winners in this populist swing towards the lesser known varietals are those from the Rioja region in Spain. There, the key red grapes are garnacha tinta, tempranillo, mazuelo and graciano, but it’s tempranillo which is by far the dominant planting through the region. Very often, the “rioja” wines are blends of different styles from across the region, but from time to time, winemakers will make a single varietal from just one grape. In Australia, there are only a relatively small number of producers who tinker with the grape, but graciano is a varietal that seems to be doing well. It’s a minnow in its Spanish homeland, but here it is finding a new home in places like King Valley (Brown Brothers), Margaret River (Happs, Woody Nook and Xanadu) and McLaren Vale (Paxton, Pertaringa and Samuel’s Gorge). A newcomer to the style, Oakvale in the Clare Valley, have released their very first graciano after the 2015 vintage and it’s still on the shelves of some of the boutique outlets. I found it on an excursion in the city at a little outlet on Macrossan Street. Their fruit is sourced exclusively from their Springfarm Vineyard in the Clare and the vintage is only a small batch as there were just 200 cases produced. The label tells us that the wine was put through wild fermentation and spent 15 months in maturation before bottle – so it should have had time to develop by now. 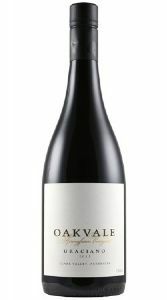 Pour it out and the depth of red colour is striking and the nose is pungent with spice and red fruits. Take that first sip and black pepper, oregano and spices engulf the blueberry and redcurrant undertow which lurks through the middle before the tannins emerge and overwhelm a slight crushed seed astringency at the back end. The beauty of the style is that it’s only of medium palate weight, has nice fruit and a spiciness to it makes it a perfect companion for chorizo pasta or bell pepper risotto. But the price is perhaps a tad ambitious – at $50 a bottle, it would be hard to take one of these instead of two nice shiraz. But it’s all about the experience and as they say, variety is the spice of life! So if you get the chance, try a graciano, close your eyes and imagine sitting on the verandah of a Spanish casa, taking a sip of local rioja and then enjoying a 30 minute siesta…..I’m in!